A young worker at her working station removes extra stitches from blue jeans. Picture: Claudio Montesano Casillas. What are the new initiatives coming up to create effective, transparent supply chains? We asked Flora Davidson, co-founder, supplycompass.com; sustainability expert Vivek Singh; Jodi Muter Hamilton, founder of communications agency, editorial platform and podcast series Black Neon Digital; Ayesha Barenblat, founder of remake.world, a storytelling platform committed to building a conscious consumer movement; and platform for sustainable fashion innovation Fashion for Good for recommendations. Flora: For us at Supplycompass, it’s about bringing supply chains into the 21st century via vetted online marketplaces and the digitisation of design development, sourcing and production management methods. Once every player in a supply chain is working from the same platform, the interconnectivity and purchasing that happens throughout the system will allow brands much greater traceability and certainty on compliance and impact. Not enough focus has been placed on driving change and implementing innovations on the supply side to date; this is where new innovations like our sourcing platform can really add value. Vivek: Recently, the Centre for Responsible Business (CRB) carried out a scoping study on the circular economy in the apparel and textile industries and discovered - as expected - a huge lack of awareness gap about the circular economy. Suppliers tend to associate circularity with recycling, making an educational initiative to promote circular economy a necessity. I am currently leading the first digital multi-stakeholder platform on sustainable business and SDGs in India to address issues of sustainability in business through continued dialogues and negotiation between industry stakeholders including local and international businesses, government and NGOs in order to build consensus, find solutions and strengthen collaborations. The GoodWeave initiative, which I launched in 2016 to end child, forced and bonded labour, is currently running successfully in the apparel and textile sector in India. Jodi: Blockchain is seen the great white hope in fashion transparency. Basically, blockchain is a digital way of proving that something is what it says it is, using decentralised or devolved trust recommendations. So, if ten people say this thing is what it is and it gets altered, you’ll see who tampered with it. The problem is, digital logic is being applied to a physical garment. People are weaving fibres with codes that you can scan, for example, [which then creates] problems for recyclability. The reason blockchain works for cryptocurrencies and things like that is because they’re both online. What the future of fashion needs is really robust ways of verifying information. We need to get to the point where it’s not just one person’s word saying ‘yes, I verify that the working conditions here are correct’ but 20. I think that the next stage of the Modern Slavery Act is to make it a compulsory for people to comply; once that happens, it will create a real business drive. The other thing we need to do is look at measures of performance as a business; not just mapping results against profit but against impact and social good, in ways similar to the B Corp. And I do feel tech could support that, whether it is just pure visibility or order or efficiency. A shy garment worker. 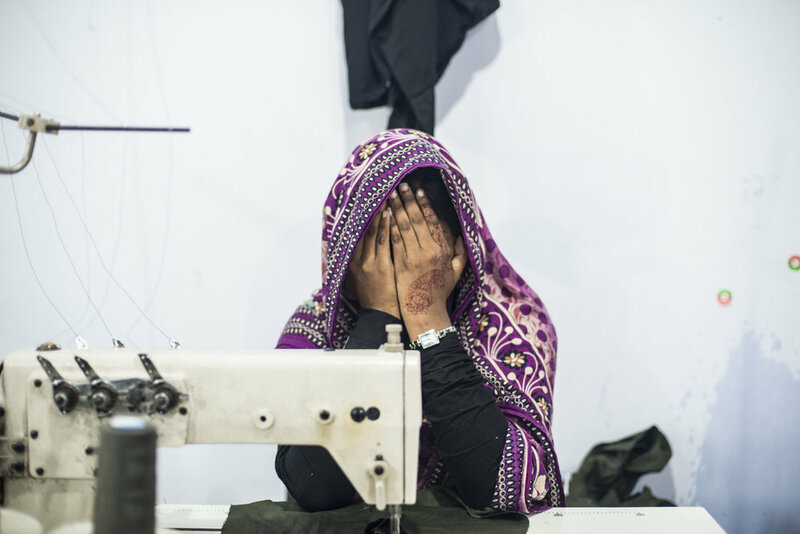 Across formal garment factories in Bangladesh an estimated 60% of workers are women. The working conditions are usually better than the informal factories. The country counts over 5,000 factories that produce clothes for the export. Well known international brands have production going on in Bangladesh. In general, the more simple pieces (plain coloured T-shirts and casual tops and trousers) are made here, because the skills of workers and machines used do not allow to make more complicated or sophisticated pieces, that are worth more money. Picture: Claudio Montesano Casillas. Agricultural blockchain start-up Bext360 has partnered with Fashion for Good, C&A Foundation and the Organic Cotton Accelerator for a pilot that uses blockchain to ensure the integrity and authenticity of the organic cotton supply chain. The Organic Cotton Traceability Pilot – also supported by C&A, Zalando, PVH Corp and the Kering Group – began in December 2018. The second phase of the pilot will be ensuring cotton can be traced from gin (a machine that separates cotton fibres from their seeds) to consumer. Retail blockchain startup MonoChain has developed an easy-to-integrate blockchain platform which brings primary and resale markets together, enabling a circular economy while simultaneously combating fake products. MonoChain facilitates the reuse of fashion items and empowers brands to generate new revenue streams by connecting them to the resale market. Singapore-based VeChain is another blockchain-enabled product management platform which enables retailers and manufacturers to collect, manage and share product data across the supply chain all the way to the consumer. Tagging systems are used to connect physical products with the digital world, facilitating transparency throughout the supply chain and product lifecycle. 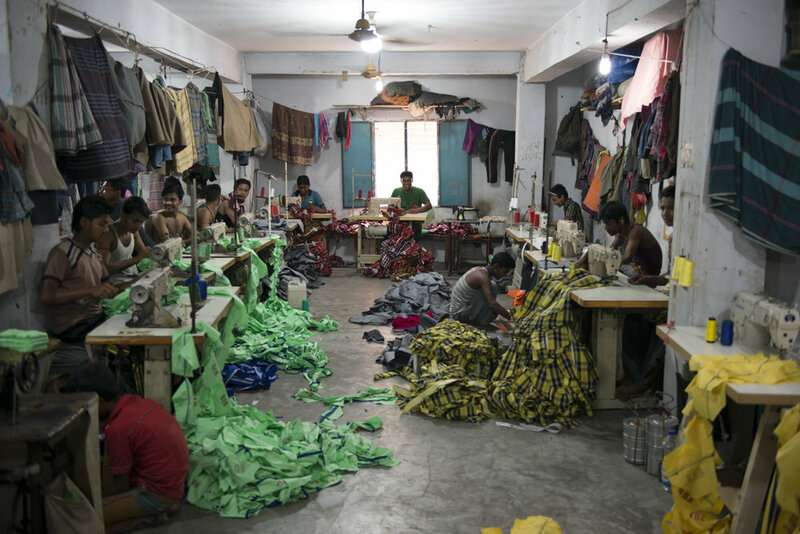 An informal garment factory located on the outskirts of the center of Dhaka. Picture: Claudio Montesano Casillas. TrusTrace is a BlockChain powered collaboration platform that helps establish transparency and product traceability between various stakeholders in the fashion industry. The service offers a scale-able digital platform that can be customised according to user requirements to support a variety of standards, processes and material, and work to ensure a transparent, traceable, sustainable and circular supply and consumption chain in a business. Opinion: When good intentions go bad.